The College is going to the dogs – and cats – Oct. 7-8 for Animal Health Week. Students and faculty of the Veterinary Technology program will host the two-day event at the Coquitlam Campus, which will feature tours of the facility – frequently used to provide free treatment to rescue and shelter animals – and the multimedia performance Adventures of a SuperVet Tech on Oct. 8. On Oct. 7, the VTEC program will also be collecting used towels or blankets – no frays or tears – all day. Donations can be dropped off at Room A2143 at the Coquitlam Campus when tours will be offered over the lunch hour, 12:30–1:30 pm. Donations are also welcome anytime. On Oct. 8, Sandra Lean-Leighton will perform her one-woman comedy show, Adventures of a SuperVet Tech from 7:30-8:30pm in Room A1470 at the Coquitlam Campus. Tickets are $10, plus a $1.59 fee and can be purchased online. Funds raised benefit the VTEC Trust Fund, which provides student awards and bursaries and is used for equipment acquisition. The show is designed to recognize and celebrate the work vet techs do, Boyle said. “This show brings up the humour and pathos we find in the veterinary field daily, and will hopefully make Vet Techs feel good about themselves. It recognizes their critical role in a veterinarian hospital, and will help the public be aware of this too,” Boyle said. Following that performance, Boyle will be leading a tour of the clinic to anyone who is interested. The VTEC program – previously known as Animal Health Technology – was established eight years ago. The two-year program takes in 60 students each year from hundreds of applicants and provides hands-on training with animals of all shapes and sizes that is needed to succeed as a veterinary technologist. 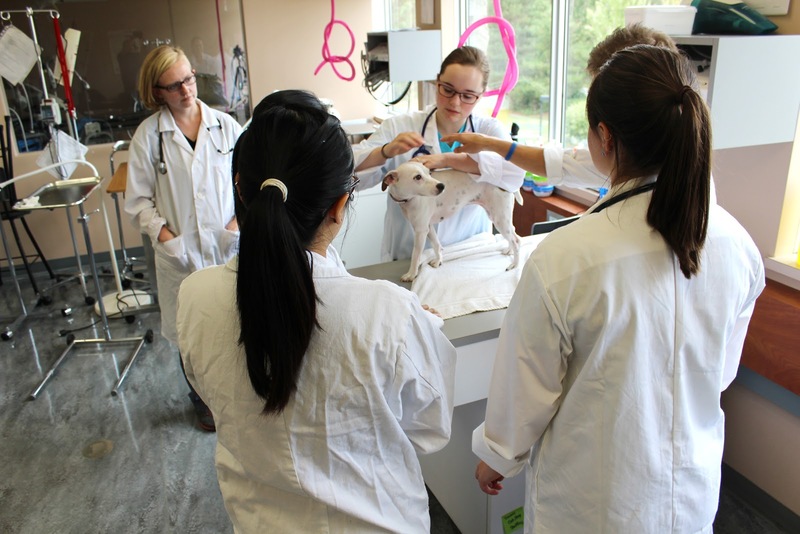 Students in the program receive training in basic and advanced nursing care, veterinary anesthesia, pharmacology, radiology and dentistry, as well as a nutrition, animal behaviour and administrative procedures.